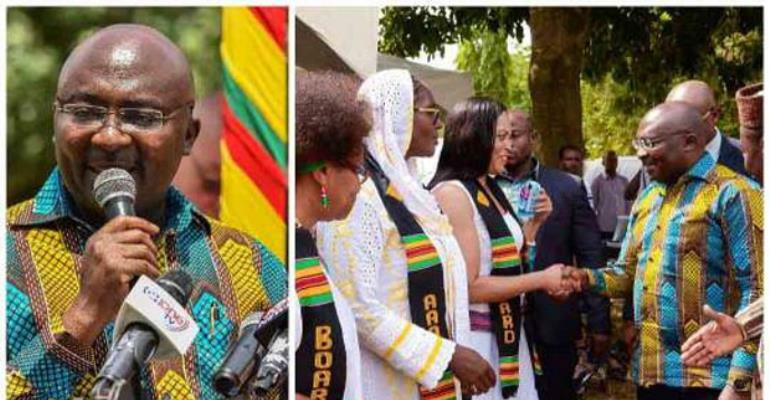 Vice President Dr Mahamudu Bawumia yesterday eulogised the late William Edward Burghardt Du Bois at the famous Du Bois Centre in Accra. This was during the celebration and wreath laying ceremony of the 150th anniversary of the scholar. Du Bois was an author, civil rights pioneer, activist and co-founder of the National Association for the Advancement of Coloured People (NAACP). He said Du Bois influenced the life of Ghana’s first President, Dr Kwame Nkrumah especially after they met at the 1945 Pan African Congress in Manchester, England. He said it was not surprising that Du Bois decided to renounce his United States citizenship to become a Ghanaian. On his part, the US Ambassador to Ghana, Robert P. Jackson, stated that the world stands on the shoulders of giants such as Du Bois. For him, the contribution of Du Bois to the development of Ghana and Africa cannot be over emphasized. Dr Du Bois Arthur McFarlane II, the great-grandson of W.E.B Dubois, in his remarks, said his great grandfather advised him to do something with his life that he enjoys which the world needs. He charged the gathering to take the advice that has kept him going in his life. In his keynote address, the third Kwame Nkrumah Chair at the Institute of African Studies at the University of Ghana, Legon, Professor Horace Campbell, said the life of Du Bois must act as a reminder to the rest of Africa today that black lives still matter. For him, the late Du Bois was more of a peace worker and a human rights activist who fought against war in the world. Today, those virtues are still relevant and they must guide the leadership of Africa if the continent is to be transformed from its current state of challenges, he said. He slammed the rhetoric of US President Donald Trump, “America First,” calling it a coded language that has elements of racism hidden in it and therefore called on blacks to reject the claims of the US President and stand up for the protection of blacks everywhere in the world.